We recently received a welcomed gift of a dozen fresh pears from a special friend. We allowed them to ripen at room temperature on our counter top and then put them in the refrigerator to slow down the ripening and preserve them long enough for us to eat them all. Ripe, fresh pears taste juicy and naturally sweet. To encourage more family members enjoy fresh fruit daily try this healthy eating tip: after a meal or in between meals ask your family, "Who wants some Pears?" 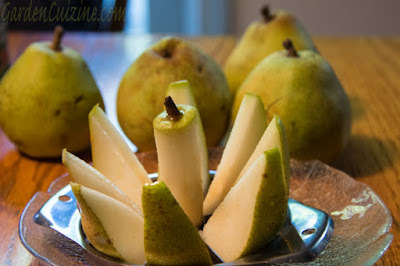 Then use a corer separator gadget to core the pear and make it blossom into individual serving slices. Serve on a small plate on the table and I guarantee you that your family will all want to be first in line for their fair share! One small pear is considered one carbohydrate serving (about 15 net grams carbohydrates) for those who are counting. Photo and blog post Copyright (C)Wind 2015. All rights reserved.